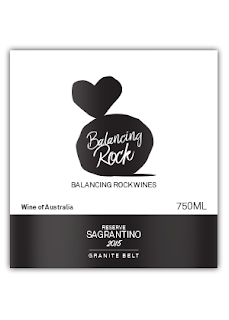 The flagship wine for Balancing Rock. It's building a steady case of excellence too with significant awards received at the Queensland Wine Awards 2018 and gold medals at the Australian Alternative Varieties Show 2017 and Australian Small Winemakers Show 2017. The only Sagrantino grown in Queensland, it comes off only six rows of estate grown fruit. It's curious to note it's labelled 'reserve' yet there is no entry level so it's been thrust into the limelight immediately. The price is up there too considering the varieties on the vines immediately on both sides of it fetch no more than $30. No doubt there is a good reason for this, mind you, members save 25% and pay $67. But the wine... The fruit and acid balance is precise. It's grippy in the mouth and highlighted by blue fruit and dark chocolate. Aromas of cola are unmistakable but fruit intensity builds great momentum through to a finish firm. Despite its 12.9% alcohol, this will age well beyond a decade.